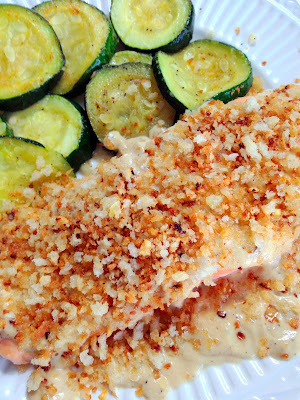 If you liked this Tilapia with Toasted Basil Butter Breadcrumbs, you will most definitely like this modified salmon version. I've made another version of Salmon with Creamy Dijon sauce, but today's recipe absolutely outshines it. There are a few extra steps and a few different ingredients, but it is so worth it. 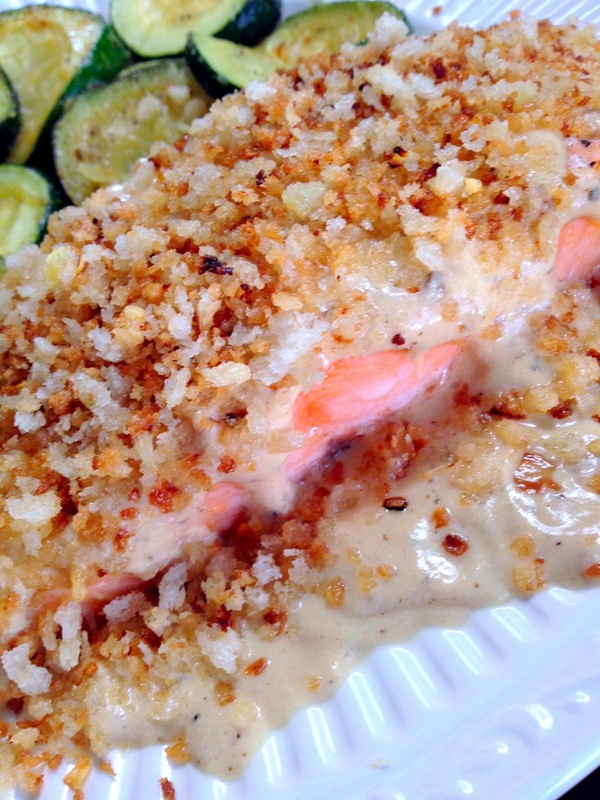 This salmon was creamy and packed with flavor. Served alongside some sauteed zucchini, and you have a fabulous meal. Cheers! *Preheat oven to 350 degrees. 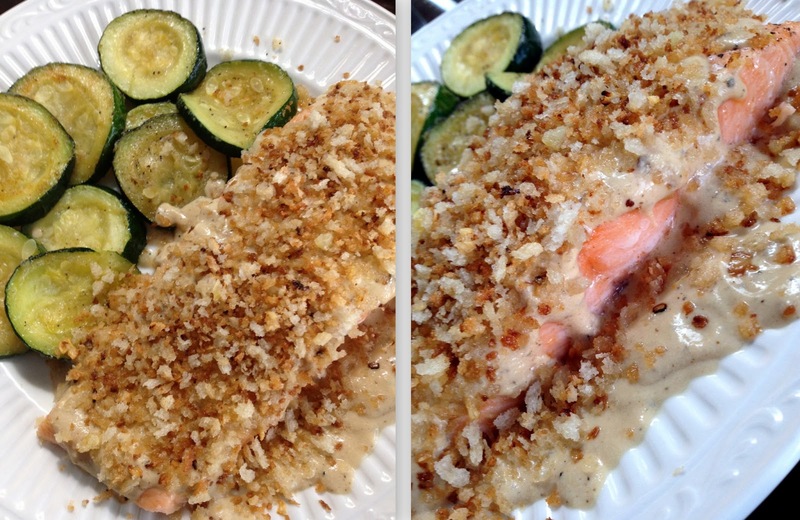 Bake salmon for 15-20 minutes, or until it flakes easily with a fork. While salmon is cooking, prepare sauce and breadcrumbs. *Prepare breadcrumbs by heating a small saucepan over medium-low heat and adding 1 tablespoon of butter. Add in 2 minced garlic cloves and cook for 30 seconds until fragrant, then stir in bread crumbs well, tossing for a minute or two until the mixture is combined and slightly golden. Set aside. *Prepare sauce by adding remaining 1/2 tablespoon of butter, shallot, garlic, and sage to a small saucepans. Stir well to coat, then cook for 1-2 minutes until sizzling. *Add white wine to sauce. Cook for 2-3 minutes, allowing it to bubble and slightly reduce. *Finally, whisk in milk and mustard. Continue to whisk and cook while milk bubbles on the sides and thickens, stirring for a minute or two. 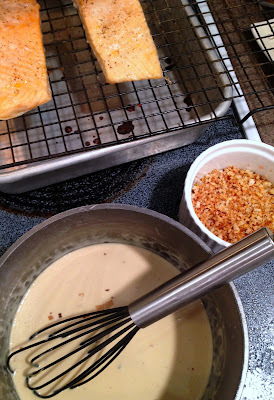 Taste and season additionally or whisk in a bit more dijon if desired. 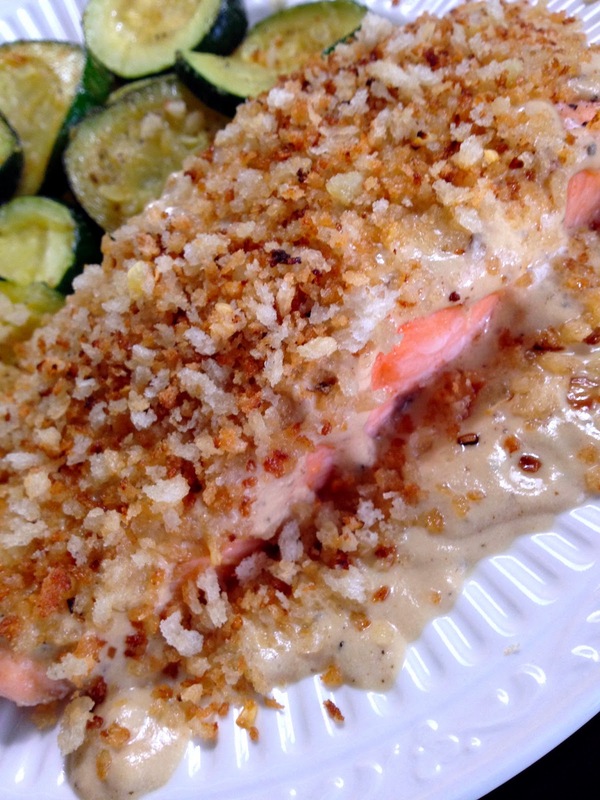 *Serve salmon immediately, drizzled with dijon cream and then top with breadcrumbs. Serve with your choice of side! We had sauteed zucchini and it was a great combination!